The basic job description of a Business Technology Analyst is to ensure that the business runs efficiently and smoothly by supervising, guiding and providing expert technical assistance. 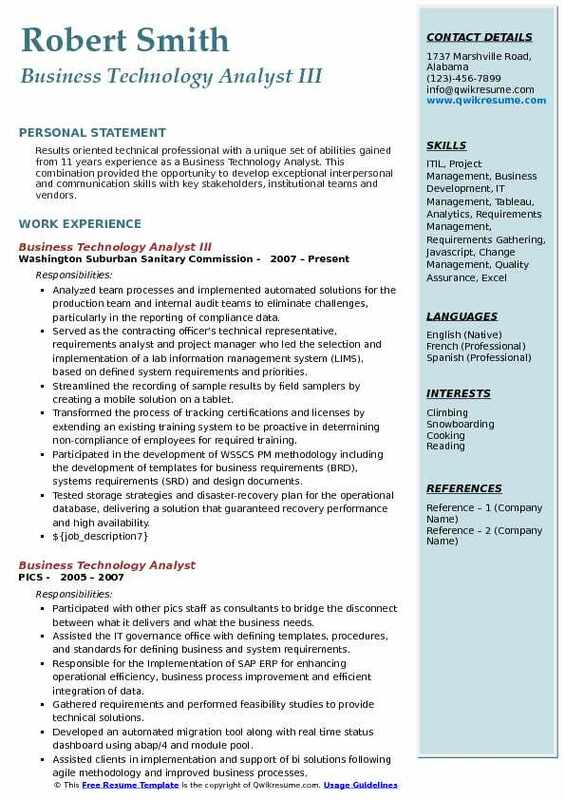 The prime responsibilities of a Business Technology Analyst comprise of managing new enhancement request, research process improvements, develop initiatives, supervise changes, prepare test cases, evaluate designs, develop and coordinate functional requirements, provide system configuration and support in application upgrading. 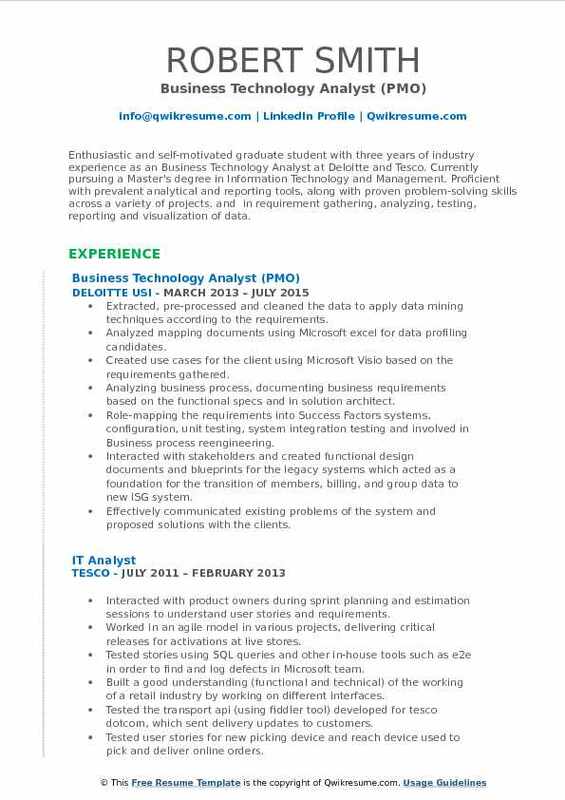 There are immense job opportunities for individuals who want to pursue their career as Business Technology Analyst, but it should be seen that only a robust looking Business Technology Analyst Resume Sample falls into the eyes of a hiring employer. The Basic qualification that is needed to fill this position is to hold a Graduate Degree in Administration, IT or Computer Science. To excel in this career a Master Degree with a Few years of experience will earn a direct call letter. Objective : 2.5 years of professional experience as a Business Technical Analyst in public sector and healthcare domains Experienced in Business Analysis, Requirement Tracing and Risk Analysis. Skills : AVA, SQL (Oracle Certified Associate), MS Excel, MS PowerPoint, MS Visio, Eclipse IDE, R Studio, I Log, JIRA Oracle, MySQL, PostgreSQL , Windows, Mac OS. Designed and developed the eligibility framework in a healthcare project that implemented the affordable care act. Replaced the client's existing solution with the new framework, reducing the case worker's manual effort by 50%. Collaborated with the client and gathered business requirements through cross-location JAD sessions and conference calls. Developed website mock-ups to ensure proactive quality control prior to project development phase. 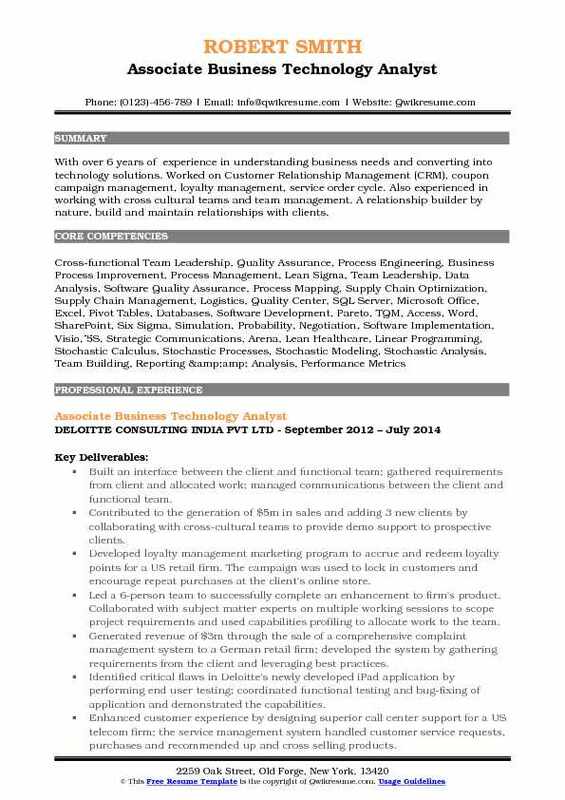 Analysed defects raised by the clients and issued change requests, getting Deloitte additional business worth $120,000. Remotely accessed live data and developed SQL queries to analyse the healthcare information of approximately 1 million. Discovered patterns in cases that helped identify the root cause of defects raised during user acceptance testing. Revamped the existing ILog JRules implementation to improve performance rating by almost 75%. 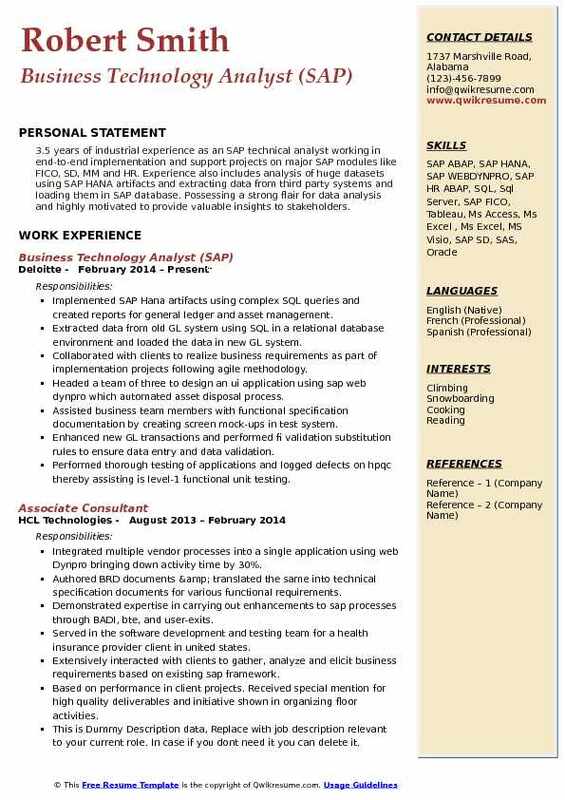 Objective : Overall 4 plus years of professional experience with 3.5 year of SAP HCM experience Worked in Fortune 500 client on ESS/MSS, PA and OM modules. Mentored team members in China about the business process of the client Trained on business analytics skills such business chemistry, survey tools, pivots, PPTS, graphs. Worked on ESS/MSS, PA, time management, HR approval, workflow, and notifications. Expert in functional specifications, testing, end user training, documentation and support activities. Analyzed the existing configuration of enterprise structure, personnel structure, payscale structure and organizational structure objects, custom objects, custom relationships, custom tables. Handled change requirements, service requests, emergency change request and adhoc requests. Provided user training on different functionalities, screen navigations, portal. Worked closely with the technical team, basis team, idm team and security team on issues relating to portal, authorizations and server. Experience in solution manager module of sap for issue login, maintaining documentation, changing status, and following through different stage before the transports are moved to production and issue is being closed. 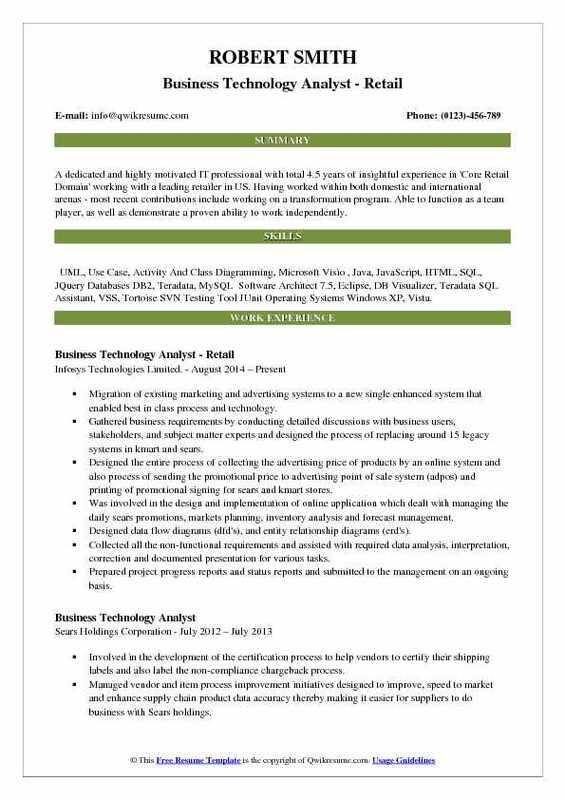 Objective : A dedicated and highly motivated IT professional with total 4.5 years of insightful experience in 'Core Retail Domain' working with a leading retailer in US. Having worked within both domestic and international arenas - most recent contributions include working on a transformation program. Able to function as a team player, as well as demonstrate a proven ability to work independently. Migration of existing marketing and advertising systems to a new single enhanced system that enabled best in class process and technology. Gathered business requirements by conducting detailed discussions with business users, stakeholders, and subject matter experts and designed the process of replacing around 15 legacy systems in kmart and sears. Designed the entire process of collecting the advertising price of products by an online system and also process of sending the promotional price to advertising point of sale system (adpos) and printing of promotional signing for sears and kmart stores. Was involved in the design and implementation of online application which dealt with managing the daily sears promotions, markets planning, inventory analysis and forecast management. Designed data flow diagrams (dfd's), and entity relationship diagrams (erd's). Collected all the non-functional requirements and assisted with required data analysis, interpretation, correction and documented presentation for various tasks. Prepared project progress reports and status reports and submitted to the management on an ongoing basis. 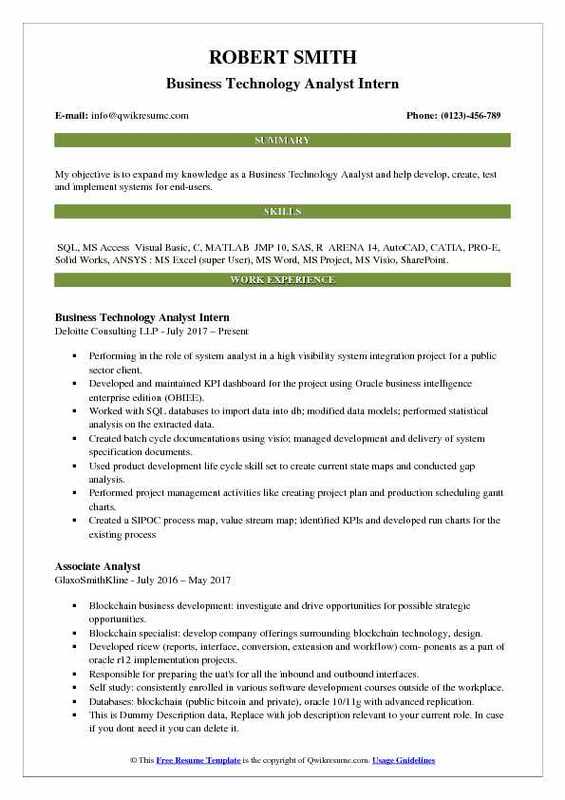 Headline : Over 3 years of experience as Business Technology Analyst in Pharmaceutical, Healthcare domains with proficiency in all aspects of software application development including requirement gathering using document analysis, questioner, interview, Joint application development(JAD), web exploring methodology, workshops with clients, developers and QA analysts. Skills : DFD, Swim Lane, ERD. MS Office Suite, MS Word, MS Excel ,MS Power Point ,MS Project RDBMS: SQL Server ORACLE Web Technologies, CSS/ HTML/ XHTML. Gathered high-level business requirements, and detail level business requirements from client and stakeholders through the interview process. Created and developed BRD(business requirement documents) and FRD (functional specification documents) using ms word and ms excel. Generated questionnaires for an in-person interview, meetings and JAD sessions. Used MS Visio to create business flow diagrams and work flow diagrams. Maintained requirement traceability matrix (RTM) and managed requirements. Participated in sprint planning, daily scrum and backlog grooming meetings to ensure the project is on schedule, to estimate existing backlogs & to refine the acceptance criteria for user stories. Employed UML(unified modeling language) methodology in creating UML diagrams such as use cases, sequence diagrams, activity diagrams and business process and workflows. Involved in conducting functionality testing, integration testing, and regression testing. Headline : Business Technology Analyst with about 7 Yerars of IT experience in software testing, business analysis, developing functional flows and test solutions for the consulting firm. Adept at problem solving, delivering high quality results with an ability to adapt to new situations. Customer focused and a team player who works efficiently under pressure with minimum supervision. Teamed with client counterparts during SAP financial transformation projects at Aflac, Sysco foods, the bank of America, and wal-mart stores, inc. Owned project management deliverables such as system access requests, end-to-end onboarding and off-boarding processes, and extensive troubleshooting for ad-hoc issues and challenges. Drove weekly and daily project-management reports for leadership, scheduled meetings, created project-wide communications, and co-organized events such as the walmart community service day. Created powerpoint presentations for critical issues for project leadership, recorded and published meeting minutes, communicated with key client leaders and team members, analyzed and synthesized data, and compiled and articulated recommendations to deloitte leadership under tight deliverable timelines. Completed additional ad-hoc activities related to project management, Supported project management activities, including major incident process and work stream planning activities. Implemented accounts payable (ap) and fixed assets (aa) modules for an international branch of the bank while teaming well in a fast-paced environment. Asked probing and insightful questions to drive the end-user design, development of business processes, and configuration of the solution utilizing sap functionality. 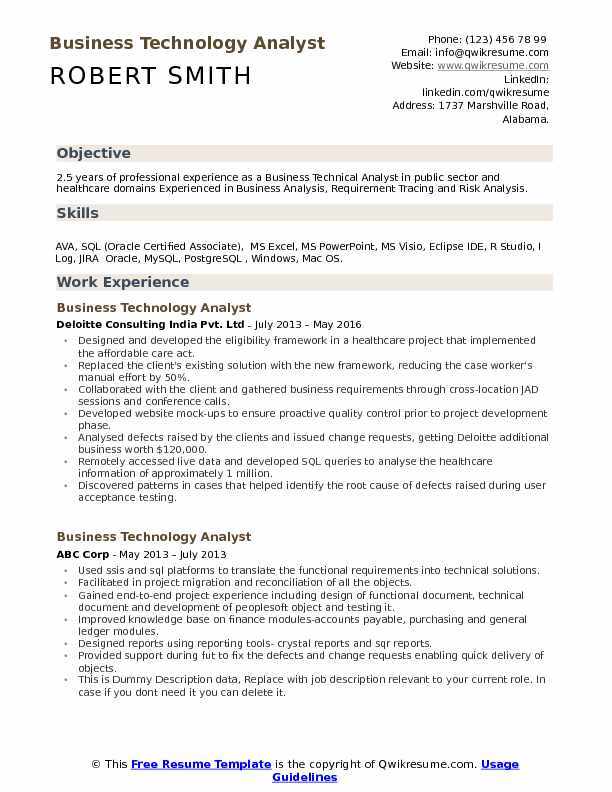 Objective : Currently working as a Business Technology Analyst working within the process improvement function. With over 5 years of experience in functional software design, implementation, support, and project management for clients in both public and private sectors. Analyze business process for assessing and collecting $800 million of user fees for food and drug administration (FDA) prescription drug user fee act (PDUFA). A coordinated effort between project work streams to analyze, capture, and create client presentation outlining business system requirements. Create, maintain, and present project update slide deck that outlines progress, setbacks, and new objectives for the monthly senior management team (SMT) meeting. Generate process flow and use case documentation to outline as-is business process work flows and complex use case scenarios. Researched, drafted, and proposed changes to client management for upcoming PDUFA vii legislation to increase revenue and reduce user fee collection time by 30%. Planned, drafted, and presented a project-wide organizational chart to assist leadership with resource planning of $1. 2 million project. Strong knowledge and understanding of business intelligence and data warehousing. 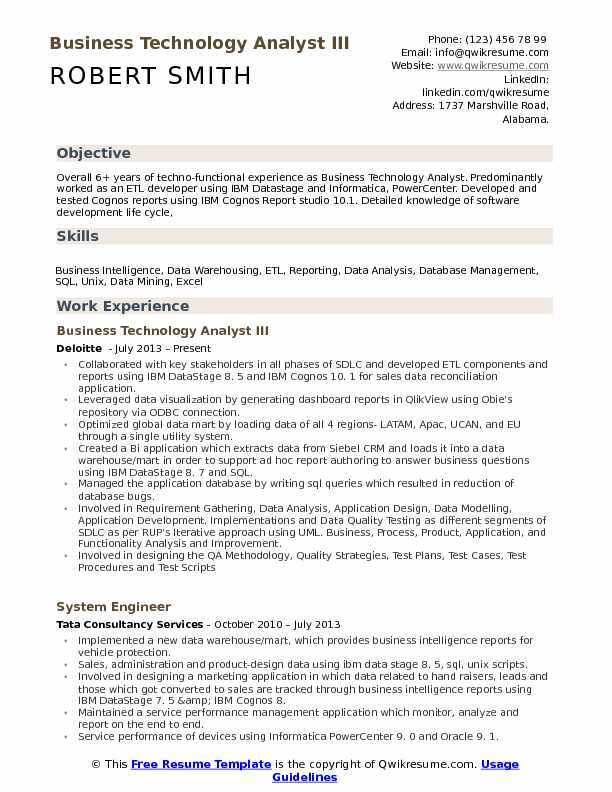 Objective : Versatile, innovative and data driven enthusiast with 3 years of experience in SQL, Agile Business Analysis, Technology Consultant, UAT experience. Ability to lead, manage and prioritize multiple projects and work with cross-functional teams. Managed the development of executive-level tableau dashboards for a public sector healthcare client. Acting as the tableau expert for the entire account, facilitating client design sessions, and managing the development and performance tuning of the dashboards. Led the design and development of Tableau dashboards for account-wide project management. streamlining the previous reporting tactics and improving the accuracy of the project. Produced technical strategy decks that drove decision-making for it executive-level clients, topics. Leveraged cloud strategy experience to co-author a cloud migration readiness white paper targeted at. Developed automated reports using IBM rational reporting/Cognos and performed data domain. Analysis to define the flow of data within a large defense agency's enterprise architecture. Headline : With over 6 years of experience in understanding business needs and converting into technology solutions. Worked on Customer Relationship Management (CRM), coupon campaign management, loyalty management, service order cycle. Also experienced in working with cross cultural teams and team management. A relationship builder by nature, build and maintain relationships with clients. Built an interface between the client and functional team; gathered requirements from client and allocated work; managed communications between the client and functional team. Contributed to the generation of $5m in sales and adding 3 new clients by collaborating with cross-cultural teams to provide demo support to prospective clients. Developed loyalty management marketing program to accrue and redeem loyalty points for a US retail firm. The campaign was used to lock in customers and encourage repeat purchases at the client's online store. Led a 6-person team to successfully complete an enhancement to firm's product. Collaborated with subject matter experts on multiple working sessions to scope project requirements and used capabilities profiling to allocate work to the team. Generated revenue of $3m through the sale of a comprehensive complaint management system to a German retail firm; developed the system by gathering requirements from the client and leveraging best practices. Identified critical flaws in Deloitte's newly developed iPad application by performing end user testing; coordinated functional testing and bug-fixing of application and demonstrated the capabilities. Enhanced customer experience by designing superior call center support for a US telecom firm; the service management system handled customer service requests, purchases and recommended up and cross selling products. 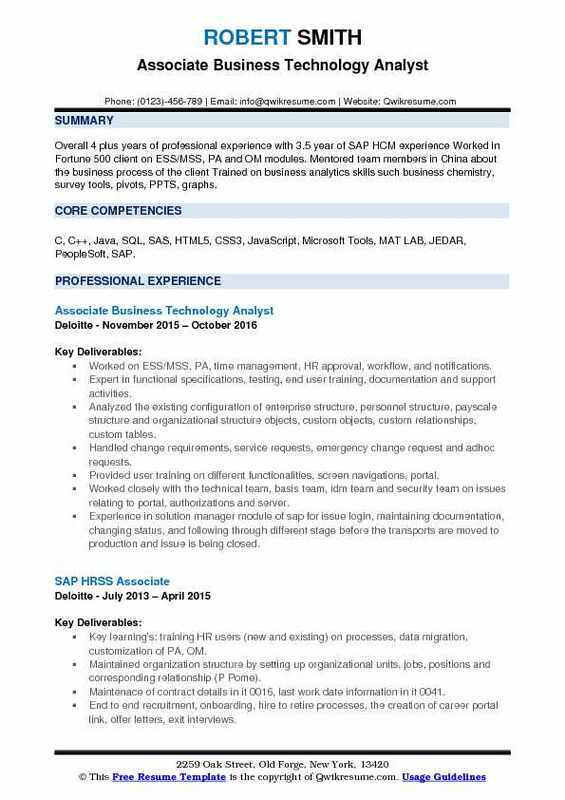 Objective : 3.5 years of industrial experience as an SAP technical analyst working in end-to-end implementation and support projects on major SAP modules like FICO, SD, MM and HR. Experience also includes analysis of huge datasets using SAP HANA artifacts and extracting data from third party systems and loading them in SAP database. Possessing a strong flair for data analysis and highly motivated to provide valuable insights to stakeholders. Implemented SAP Hana artifacts using complex SQL queries and created reports for general ledger and asset management. Extracted data from old GL system using SQL in a relational database environment and loaded the data in new GL system. Collaborated with clients to realize business requirements as part of implementation projects following agile methodology. Headed a team of three to design an ui application using sap web dynpro which automated asset disposal process. Assisted business team members with functional specification documentation by creating screen mock-ups in test system. Enhanced new GL transactions and performed fi validation substitution rules to ensure data entry and data validation. Performed thorough testing of applications and logged defects on hpqc thereby assisting is level-1 functional unit testing. 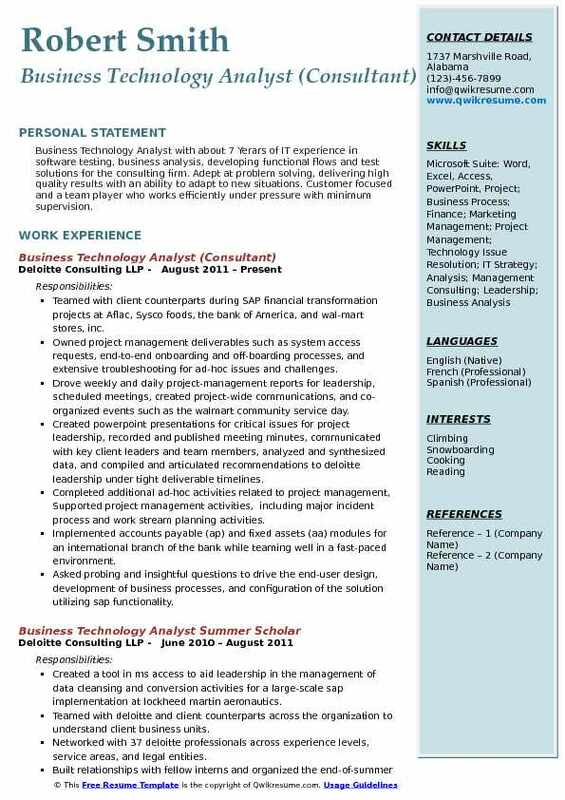 Summary : Results-driven versatile Business Technology Analyst with extensive experience of 7+ years in eliciting, analyzing, and documenting the requirements for business processes, policies, and information systems. Skills : SAP Business Objects, HPQC, Microsoft Visual Studio, Microsoft Office Suite - Word, Excel, PowerPoint, Visio, Project, Adobe Photoshop CS4, ClearCase, SharePoint, QueryExpress , MS SQL Server. Produced high-quality SDLC artifacts; functional specifications, RTMs, wireframes, UML use cases that comply with sdlc guidelines for business area. Interacted with various members at the management level to understand business processes, decision models and project scope. Used questionnaire, surveys, jad sessions and brainstorming sessions as requirement elicitation techniques. Scheduled demo and UAT sessions with our clients after the completion of every sprint. Worked closely with the quality assurance team and developed test scripts using the developed use cases as the platform. Created custom ad-hoc reports using sap business objects for management and cross-functional teams. Executed test cases and managed the defects in the Quality Center. Collaborated with key stakeholders in all phases of SDLC and developed ETL components and reports using IBM DataStage 8. 5 and IBM Cognos 10. 1 for sales data reconciliation application. Leveraged data visualization by generating dashboard reports in QlikView using Obie's repository via ODBC connection. Optimized global data mart by loading data of all 4 regions- LATAM, Apac, UCAN, and EU through a single utility system. Created a Bi application which extracts data from Siebel CRM and loads it into a data warehouse/mart in order to support ad hoc report authoring to answer business questions using IBM DataStage 8. 7 and SQL. Managed the application database by writing sql queries which resulted in reduction of database bugs. Involved in Requirement Gathering, Data Analysis, Application Design, Data Modelling, Application Development, Implementations and Data Quality Testing as different segments of SDLC as per RUP's Iterative approach using UML. Business, Process, Product, Application, and Functionality Analysis and Improvement. 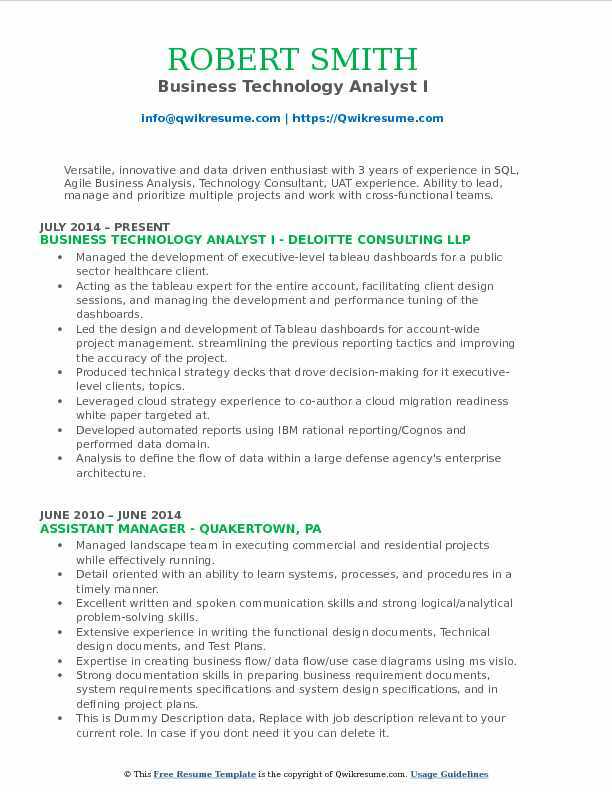 Objective : Business Technology Analyst with about three years of IT experience in software testing, business analysis, developing functional flows and test solutions for the consulting firm. Adept at problem solving, delivering high quality results with an ability to adapt to new situations. Customer focused and a team player who works efficiently under pressure with minimum supervision. Provide project management on an agile six-person team to implement a large nationwide data collection system for rural usps carriers. Served as ScrumMaster for the team to organize and enforce work collaboration. Conducted sprint planning and retrospectives for the team to ensure accountability and to manage stakeholder expectations. Communicate with multiple development teams including CIO, VPS, union leadership and a panel of industrial engineers as a liaison between business and technology issues. Maintain the project plan and manage weekly status updates from all teams involved. Schedule meetings with teams and record notes so that all teams are kept informed and up to date. Managed service level targets to accurately record activities, assets, and compliance and maintain ownership for problem resolution by using an online ticketing system to document and trace end user incidents. 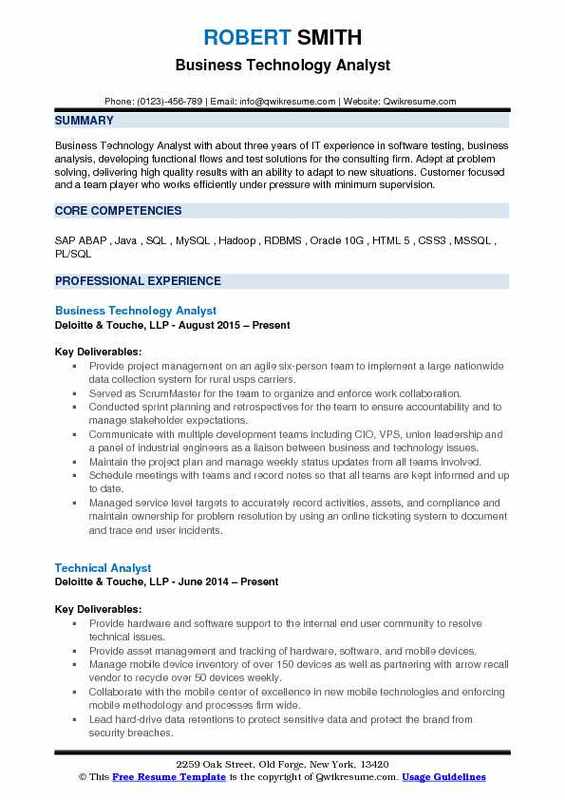 Objective : My objective is to expand my knowledge as a Business Technology Analyst and help develop, create, test and implement systems for end-users. Skills : SQL, MS Access Visual Basic, C, MATLAB JMP 10, SAS, R ARENA 14, AutoCAD, CATIA, PRO-E, Solid Works, ANSYS : MS Excel (super User), MS Word, MS Project, MS Visio, SharePoint. Performing in the role of system analyst in a high visibility system integration project for a public sector client. Developed and maintained KPI dashboard for the project using Oracle business intelligence enterprise edition (OBIEE). Worked with SQL databases to import data into db; modified data models; performed statistical analysis on the extracted data. Created batch cycle documentations using visio; managed development and delivery of system specification documents. Used product development life cycle skill set to create current state maps and conducted gap analysis. Performed project management activities like creating project plan and production scheduling gantt charts. Objective : Enthusiastic and self-motivated graduate student with three years of industry experience as an Business Technology Analyst at Deloitte and Tesco. Currently pursuing a Master's degree in Information Technology and Management. Proficient with prevalent analytical and reporting tools, along with proven problem-solving skills across a variety of projects. and in requirement gathering, analyzing, testing, reporting and visualization of data. 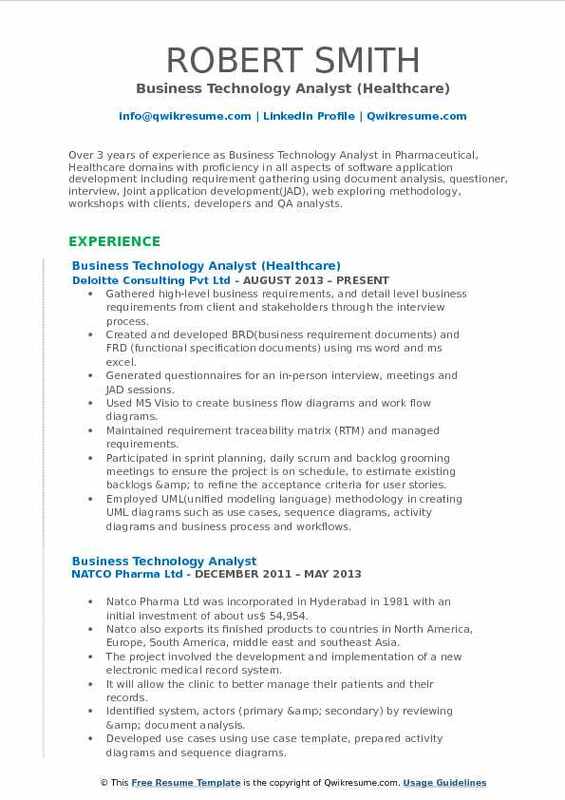 Skills : R Studio, Tableau, SPSS, Rapid Miner R, C, C++, HTML, JAVA, .Net MS Visio, MS Excel, MS Power Point, MS Word, MS Visual Studio, MS Team Foundation Server, MS Test Manager , SQL SERVER, MS Access SDLC , Waterfall, Agile Methodology. Extracted, pre-processed and cleaned the data to apply data mining techniques according to the requirements. 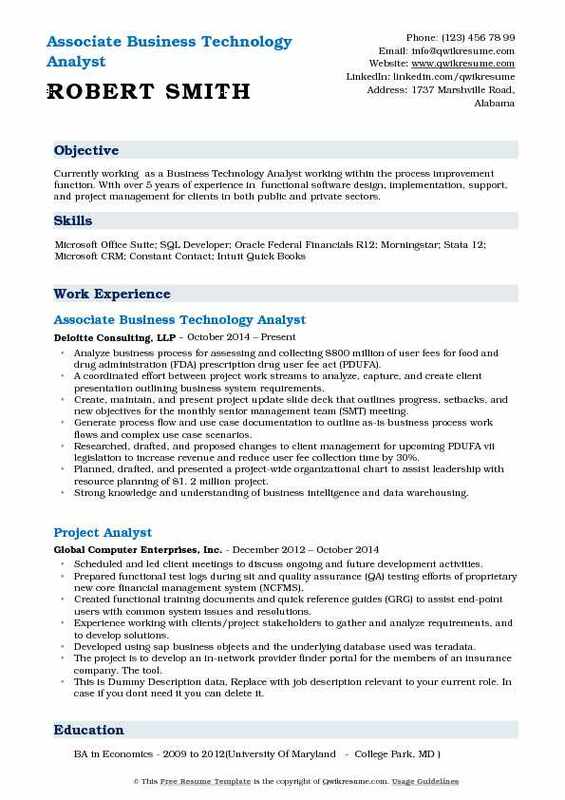 Analyzed mapping documents using Microsoft excel for data profiling candidates. Created use cases for the client using Microsoft Visio based on the requirements gathered. Analyzing business process, documenting business requirements based on the functional specs and in solution architect. Role-mapping the requirements into Success Factors systems, configuration, unit testing, system integration testing and involved in Business process reengineering. Interacted with stakeholders and created functional design documents and blueprints for the legacy systems which acted as a foundation for the transition of members, billing, and group data to new ISG system. Effectively communicated existing problems of the system and proposed solutions with the clients. 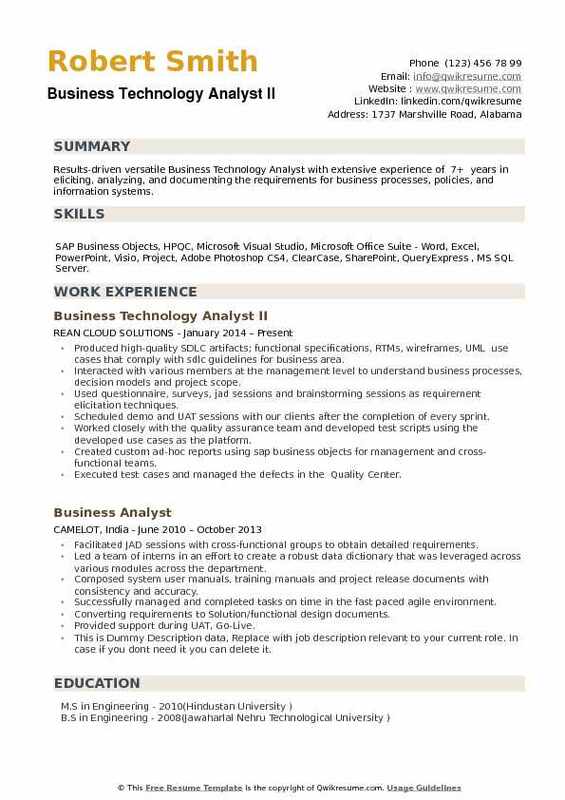 Summary : Results oriented technical professional with a unique set of abilities gained from 11 years experience as a Business Technology Analyst. This combination provided the opportunity to develop exceptional interpersonal and communication skills with key stakeholders, institutional teams and vendors. Analyzed team processes and implemented automated solutions for the production team and internal audit teams to eliminate challenges, particularly in the reporting of compliance data. Served as the contracting officer's technical representative, requirements analyst and project manager who led the selection and implementation of a lab information management system (LIMS), based on defined system requirements and priorities. Streamlined the recording of sample results by field samplers by creating a mobile solution on a tablet. Transformed the process of tracking certifications and licenses by extending an existing training system to be proactive in determining non-compliance of employees for required training. Participated in the development of WSSCS PM methodology including the development of templates for business requirements (BRD), systems requirements (SRD) and design documents. Tested storage strategies and disaster-recovery plan for the operational database, delivering a solution that guaranteed recovery performance and high availability.